Chin Up! Buttercup is a calligraphic sans-serif typeface created & published by Nicky Laatz which it comes in three styles, cute sans serif, cute doodles, alternates and natural double letter. It was designed to be suitable for typographic purpose, packaging, branding, advertising, display, greetings but also for photo and web. What do you want to choose, Chin Up!, Buttercup, or both? Enjoy!! 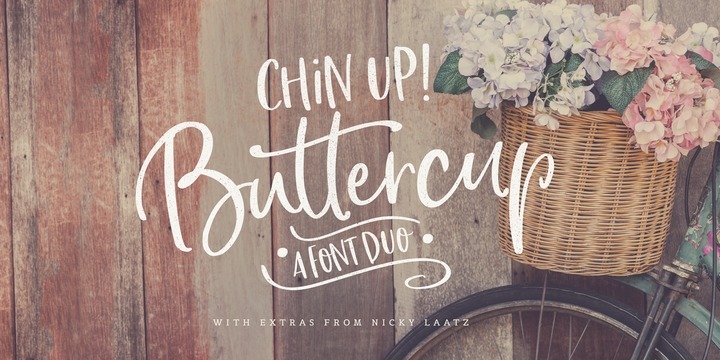 A font description published on Monday, February 12th, 2018 in Fonts, Nicky Laatz, Nicky Laatz by Alexandra that has 2,863 views.